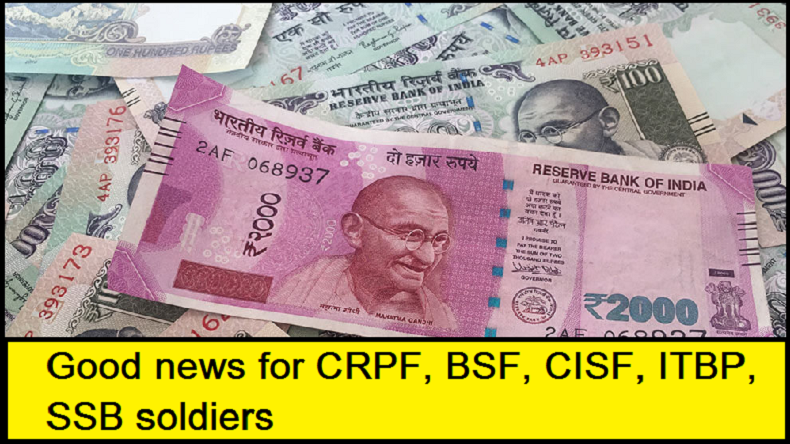 7th Pay Commission latest news for CRPF, BSF, CISF, ITBP, SSB soldiers: Ministry of Finance agrees to review all pending demands of the 9 lakh Central Armed Police Force personnel, following the 7th pay commission recommendations. 7th Pay Commission latest news for CRPF, BSF, CISF, ITBP, SSB soldiers: The Central Reserve Police Force (CRPF), Border Security Force (BSF), Central Industrial Security Force (CISF) and Indo-Tibetan Border Police (ITBP) and Sashastra Seema Bal (SSB) soldiers are likely to receive a piece of good news soon as the Ministry of Finance has agreed to review their long pending demands. More than 9 lakh Central Armed Police Force personnel have been demanding the exemption of ration money, and risk and hardship allowance from taxes from a very long time and now the Ministry of Finance has agreed to look in to the matter to provide benefits from the changes in existing rules as suggested by the 7th Pay Commission. The 7th Pay Commission, in its report, said allowance given as part of free ration to jawans should be exempted from the income tax. According to the reports, the government may announce these changes in the next session of the Parliament in the upcoming full Budget 2019, which will be presented by the new government after the 17th Lok Sabha elections. A few days ago, the Minister of Home Affairs had written to a letter to the Ministry of Finance in view to the pending demands of 9 lakh CRPF, BSF, CISF, ITBP, SSB soldiers. And now responding to the letter from Rajnath Singh-led department, the Ministry of Finance has agreed to take cognizance of Central Armed Police Force demands. Reportedly in the reply, MoF gave an assurance to examine the demand during the ensuring budgetary exercise. The non-gazetted rank personnel of Central armed police forces like constables, assistant sub-inspectors etc are entitled to ration money allowance of Rs 3,000 per month and they are demanding the exemption of ration money, and risk and hardship allowance from taxes. The 7th Pay Commission or Pay Commission is a body set up by the Government of India to review the salary structure and resolve the demands of the Central government employees. Since independence, the pay commissions have been set up on a regular basis and its headquarter is in New Delhi.